Prime Minister Binyamin Netanyahu has turned to the hareidi parties once again, officials from United Torah Judaism (UTJ) revealed Sunday night, in yet another attempt to replace Yesh Atid in the coalition following increased tensions over the past week. Netanyahu reportedly turned to UTJ and Shas, sources said - and was so desperate to maintain a coalition that he was willing to turn a "blind eye" and keep at arms' length from sensitive issues like the hareidi draft, even after two years of passing that particular bill into law. However, UTJ and Shas turned him down - and sources told Arutz Sheva that they were unwilling to "save" Netanyahu's place in the government simply because he asked them to do so. 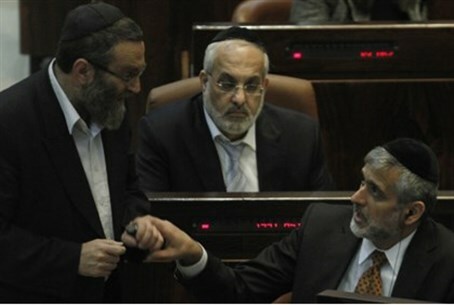 "We can talk about it next [Knesset] term," sources said, "depending on what he's willing to give us." MK Yaakov Litzman (UTJ) convened an emergency meeting with Agudat Yisrael members and heard similar things from them: that they are tired of being "used." "It is impossible that every time he encounters tensions with [Finance Minister Yair] Lapid, he will summon the hareidim," another official said. The Prime Minister and Finance Minister have had several disagreements, most recently revolving the 2015 state budget and Lapid’s 0% VAT law, which Netanyahu has tried to shelve. But those tensions flared again several days ago, when Channel 2 published a report saying that Lapid had been attempting to assemble his own coalition - possibly due to frustrations over the languishing 0% VAT law. A new coalition crisis now appears to be brewing over the Jewish State bill, with right-wing coalition members furious at both Hatnua and Yesh Atid for opposing it in what they claim is a flagrant breach of previous coalition agreements.